Workout: 14 miles @ 7:25 pace. Weather: 61 degrees, cloudy. Recap: There we go – that’s more like it. Great day. Can’t complain about a thing. I feel like a commercial for bad dietary habits but here goes. To fuel today’s run, I ate two small pizzas and six chocolate chip cookies last night plus ¾ cup of sugar in the form of Kool-Aid this morning about an hour before getting outside. Now, I’m not recommending it, but I wouldn’t lie to you either. It’s bad for my character. I didn’t want to bonk again like Thursday, so something had to change. This IS what I ate. And the run turned out great. Body responded really well to having…you know..fuel. Usually on these longer runs, it takes a second to get into it, but not today. Found the goal pace early and never really let up. 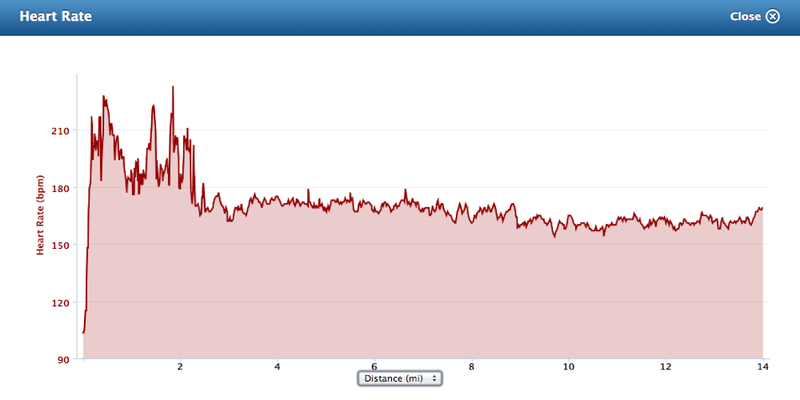 With about four miles to go (10 miles in) I felt like I was breathing a little bit harder. When I lost concentration and started daydreaming, I tended to fall of the pace slightly. But there was never any real doubt. Knees and feet started getting a little sore about mile 12, but with two miles to go it didn’t take much prodding to finish. Made it my goal to finish the last mile with as few steps as possible. Felt more efficient. Last mile was in 6:56. 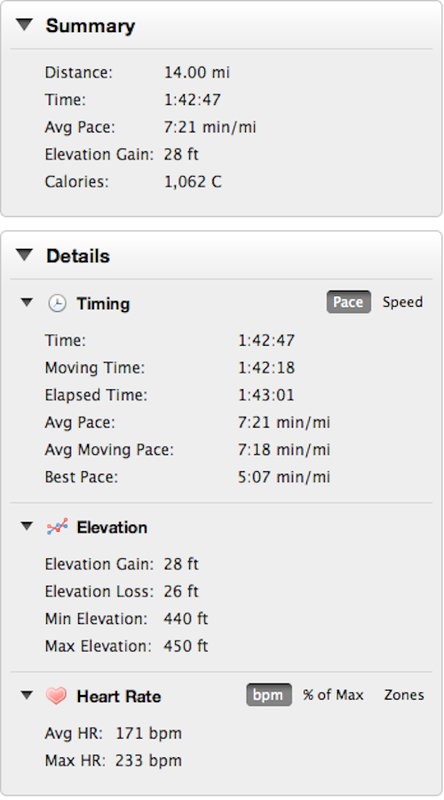 Run was at 7:21 pace overall. Proud of that. The goal is 18 miles at 7:02 pace in five weeks. Good to know I can close out at that pace now. Past experience had taught me only to look at distance and pace during my harder training runs – not heart rate. Today was a good example of why this practice began. 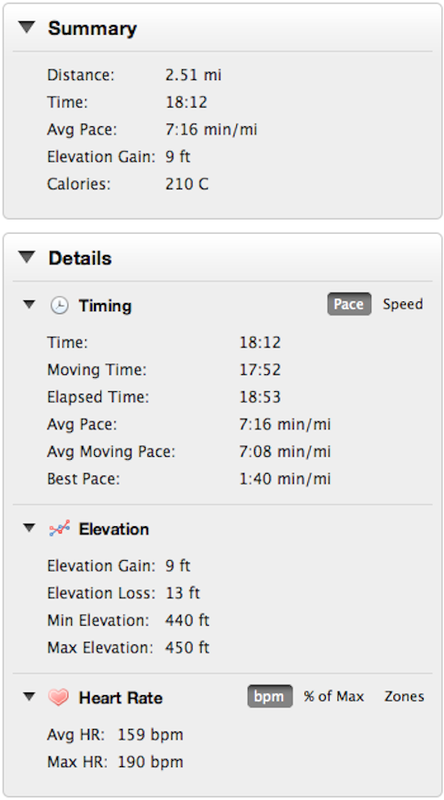 After completing the workout, I checked the overall stats and saw an average HR of 170 bpm – pretty high for a long run. 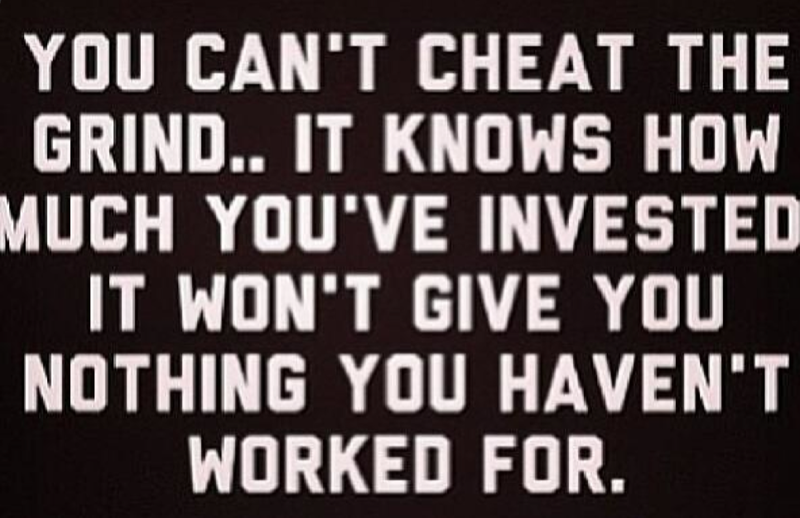 I wondered why, on a day where I felt great, would my heart have been working so hard. After checking the mile-by-mile statistics, I knew exactly why. My heart rate monitor gives me problems about half my runs, registering heart rates that are way too high. Usually it does this for a second or two before popping back into normalcy. Today, it did something outrageous. Maybe this graph doesn’t make a lot of sense, so allow me to interpret. Telling the story from the monitor’s point of view, apparently, I ran the first two miles at average heart rates of 194 bpm, about, you know, 97% effort. Then, without slowing down, the run got easier. The heart rate dropped to about 170 bpm for the next few miles. 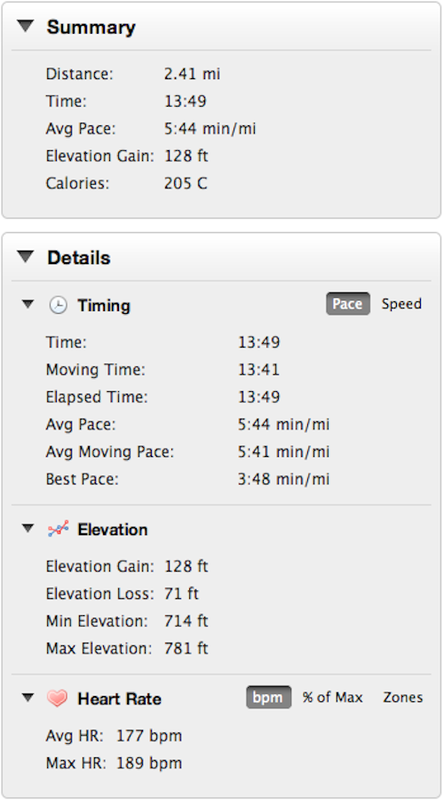 BUT…I finished the run at around 160 bpm, while speeding up. Lesson of the day: there is a danger in looking at the heart rate monitor for guidance during the run. I would imagine this would hold true at even lesser margins of error. In the end, I felt fine. Didn’t need the machine to tell me anything different. Lesson 2 might be to get another heart rate monitor. After hitting my mileage goal last week, I felt a little less motivated this week and it showed. Missed two easy runs on Wednesday and Friday. Had a crappy speedwork session on Thursday. At the end of the week though, great long run, and I think everything’s still on track.